Three Hoppers with Independent Variable Rate Control. 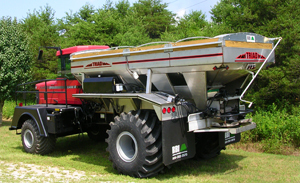 This spreader will give you the ultimate control over your Agricultural Field Prescription. The Triad has Three Hoppers, each can be controlled independently. Call BBI to find out which Agricultural Electronics are currently capable of controlling three independent variable rate bins on one Triad Spreader. ﻿Triad BBI﻿ - Patented THREE Hopper with INDEPENDENT Variable rate. Ideal for Precision Dry Material Application - Advanced Technology for the most sophisticated farmer! TRIAD is designed to keep up with the latest advancements in prescribed, guided, variable rate application of nutrients. Triad - Patented Three Hopper Body with INDEPENDENT Variable Rate. 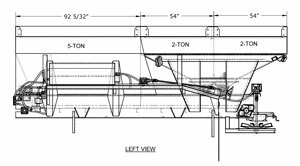 Capacity: Main Hopper is 210 cu ft Struck, Hoppers 2 is 84 cu ft Struck, Hopper 3 is 84 cu ft Struck. New in 2011! 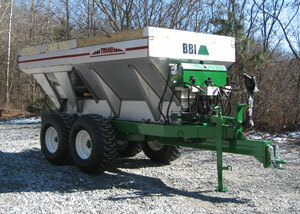 BBI Pull Type Triad - Patented - Three Independent Hoppers - with Independent Variable Rate - Fertilizer Lime Spreader. Ideal for Precision Dry Material Application - Advanced Technology for the most sophisticated farmer! TRIAD is designed to keep up with the latest advancements in prescribed, guided, variable rate application of nutrients. Plug and Play TODAY with Ag Leader - more electronics options are in development! Call to find the best option for you!